…..really I am! And just to prove it, I am going to post a card! There, you see, I have been doing some stamping. But only a little. I made this card for a workshop which I did a couple of weeks ago, during one of the few days when I have not been ill over the past few months. I managed to get the workshop done and order in etc just in time to come down with the next bout of illness. But I feel as though I am on the mend and am looking forward to getting back into stamping and running classes and workshops. 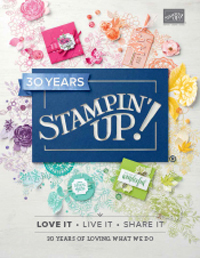 Unfortunately I missed out on this year’s Stampin’ Up! convention because my lovely boy, Jamie, had pneumonia and was very sick. And as it turns out, I had a very bad throat infection that weekend and couldn’t speak for two days, so it was probably just as well that I couldn’t get there. 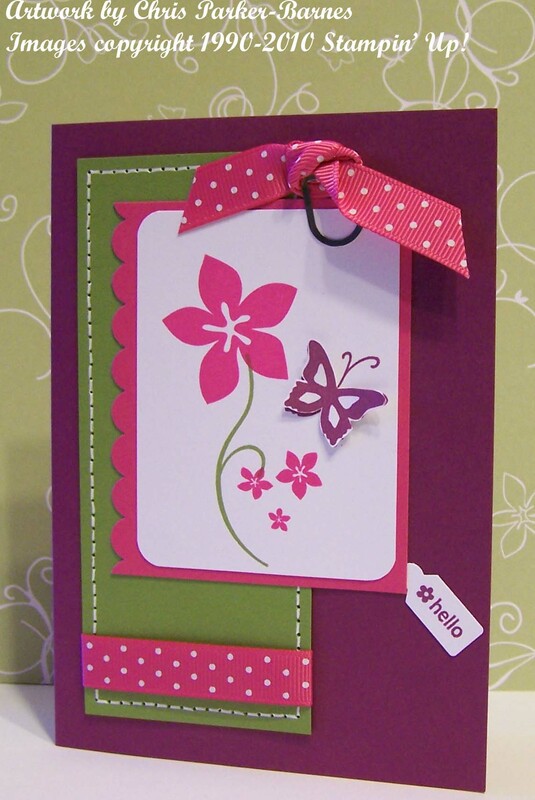 Anyway, this card was a nice simple one, perfect for one of my beginners workshops. The girls also got to use some of the new clear mount blocks and stamps, so that they could feel how lovely they are to use, as well as sampling those gorgeous new colours. And I demonstrated to the workshop guests, how to dress that same card up, and make it just a bit more exciting and interesting. So here is the “upgraded” version. Stamp Sets: Cottage Garden, Tiny Tags. Cardstock: Rich Razzleberry, Melon Mambo, Old Olive, Whisper White. Ink: Rich Razzleberry, Melon Mambo, Old Olive. Accessories: Paper Piercing Tool and Mat Pack, White Gel Pen, Paper Snips, Scallop Edge Punch, Medium Jewelry Tag Punch, Corner Rounder Punch, Melon Mambo Polka-Dot Grosgrain Ribbon, Clips Assortment. Aren’t those colours just gorgeous! I am currently in the process of working out dates for my upcoming classes, so make sure you check back over the next day or so to see what exciting things I have in store for you. Most of them will use some new stamps, punches and accessories from the current mini catalogue. 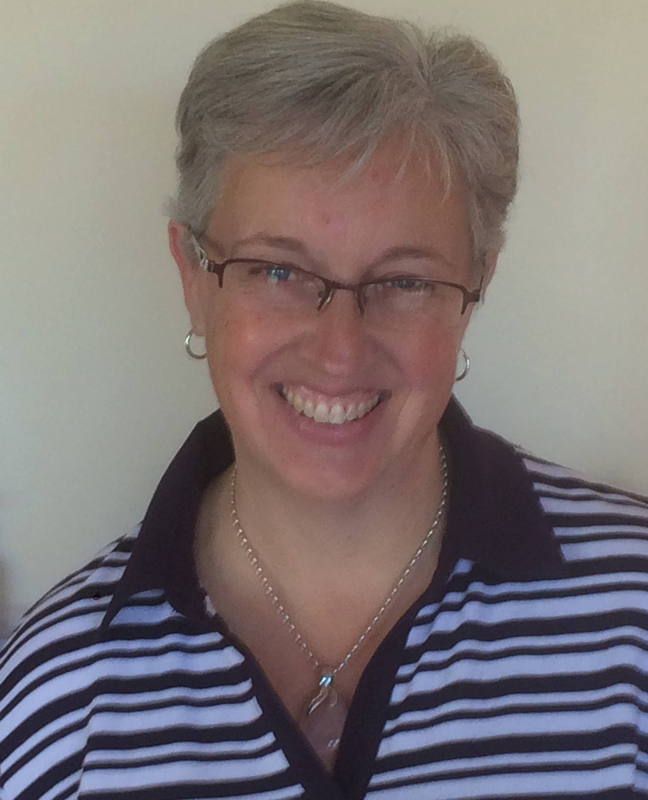 I will also come back with some exciting news from Stampin’ Up! Glad to see you and Jamie are on the mend!!! Shame about missing Convention, but like you said, probably lucky you didn’t go with being sick yourself. Take care of yourself and your family Chris!!! So pleased you are on the mend Chris. Hope Jamie is well again too. Convention was fantastic!!!! Melbourne next year. 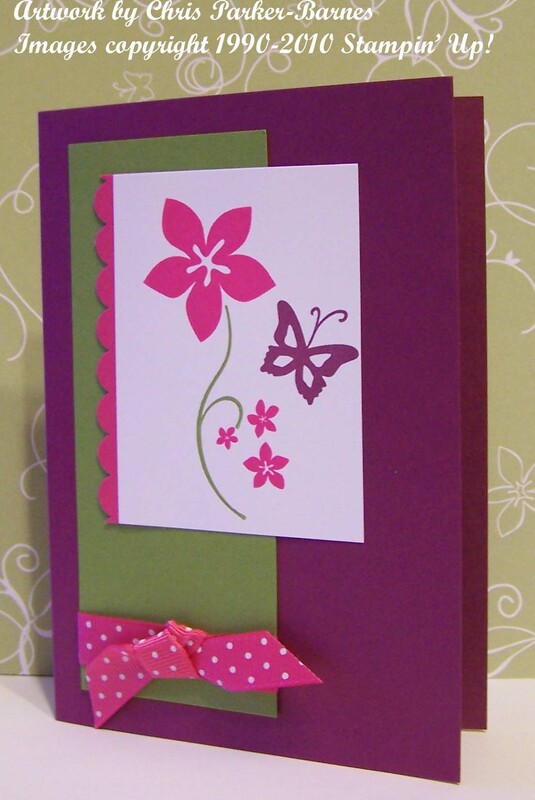 Love your card and the stepped up version.